Couch feet usually go unnoticed without so much as a thought unless a problem arises. Upon moving the couch, you might notice scratches on that nice hardwood floor in the area where the couch feet were. The couch shifts over time, either from sitting on it or from pushing rather than lifting to adjust its position. Floor scratches result from couch legs with damaged or missing gliders or pads. Several protective measures help prevent similar floor damage in the future. Couch feet without floor protectors can mar or scratch flooring during everyday use. Floor protectors designed for the bottoms of furniture legs create a soft cushion between the furniture and the flooring. These pads are typically made of felt or flannel and have a stick-on adhesive applied to one side. Removing the paper backing reveals an adhesive that goes on the bottom of a flat couch leg. Note the diameter of your couch leg tips first to purchase the proper floor protectors; if too wide, these pad will be obvious from across the room. Flip the couch onto its back so you can feel the bottoms of all legs. If the surface of even one of them feels rough, there's the culprit. Sand gently with a fine-grit sanding block until the leg bottoms are smooth, if legs are wood. 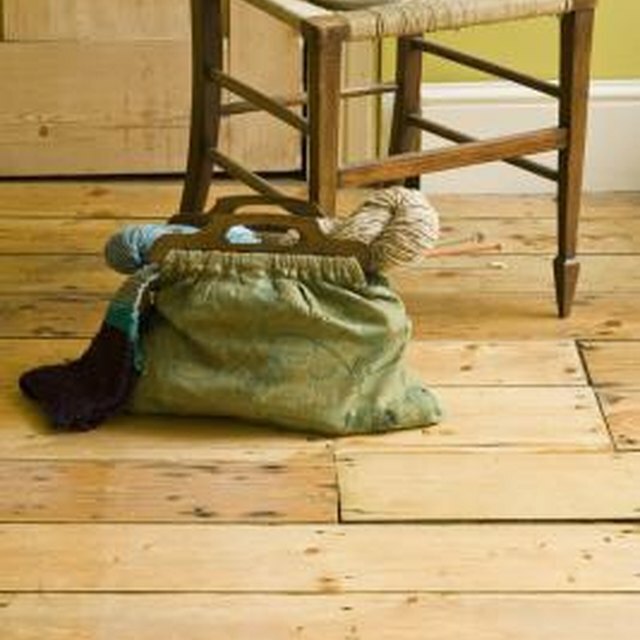 Apply furniture wax to the bottoms for added floor and chair leg protection. If you can't find the type of soft pads needed to fit your couch legs, make your own from craft felt or thin craft foam. A thick felt works better than thin varieties, as it won't wear through as quickly. Set a sheet of felt or foam underneath a chair leg, trace around it, then cut out the shape for a sized-to-fit floor protector. Two-part epoxy holds the foam to the bottom of the couch legs. Tip the couch up to check the pads from time to time, as the weight of both the couch and people upon it will wear the pads thin eventually. Rubber or plastic floor protectors made for crutches or metal chairs can also be used on couch legs in a pinch, but they might be obvious unless you paint them to match the color of the legs. Besides pads on the bottoms of couch legs, treating the couch and floor with care will help avoid unwanted floor scratches. Place an area [rug](https://society6com/rugs?utm_source=SFGHG&utm_medium=referral&utm_campaign=8775) under the couch -- it dresses up the floor a bit while preventing scratches. Small bits of corrugated cardboard cut slightly smaller than the couch leg bottoms can be placed under the legs to act as temporary furniture pads if you can't come up with real ones. When moving the couch, use furniture glides -- those plastic discs with a thick fabric pad on the bottom -- to protect both the couch feet and the floor. Is a Latex Rug Safe for a Hardwood Floor?